Mark Jarvis, CEO of Giga Metals Corp. (TSXV:GIGA) today announced analytical results from 38 of 40 holes drilled in 2018 on the Company’s Turnagain Nickel/Cobalt Project. 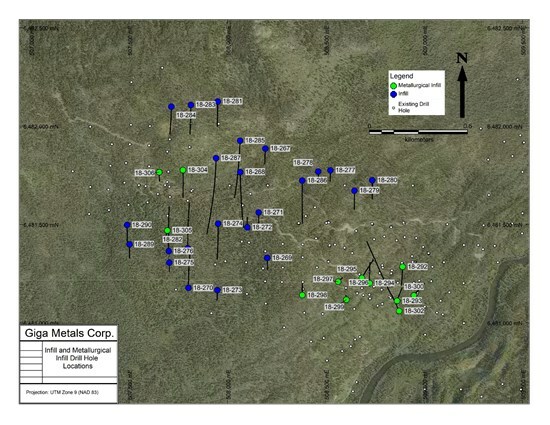 Mark Jarvis, CEO of Giga Metals Corp. (TSXV:GIGA) today announced analytical results from 38 of 40 holes drilled in 2018 on the Company’s Turnagain Nickel/Cobalt Project. The Company is still awaiting assay results from one infill hole and one metallurgical infill hole, and these results will be announced when received. – Thirteen metallurgical infill holes totaling 3,073.0 metres within the Horsetrail and Northwest zones of the Turnagain deposit. – Twenty-three infill holes totaling 5,866.9 metres sited between the Horsetrail and Northwest zones of the Turnagain deposit. – Two exploration holes totaling 1,119.8 metres in the platinum-enriched Attic Zone. – Two exploration holes totaling 775.1 metres in the MAG zone roughly 5.6 kilometres northwest of the Horsetrail zone. ²NW: Northwest zone; HT: Horsetrail zone; EOH: end of hole. Metallurgical infill program holes were drilled at various angles into continuous or near-continuous disseminated mineralization. Engineering and metallurgical studies are underway with an objective of producing a Pre-Feasibility study. Extensive metallurgical work indicates a clean concentrate grading 18% nickel and 1% cobalt is reliably achievable using simple “off-the-shelf” processing technology.